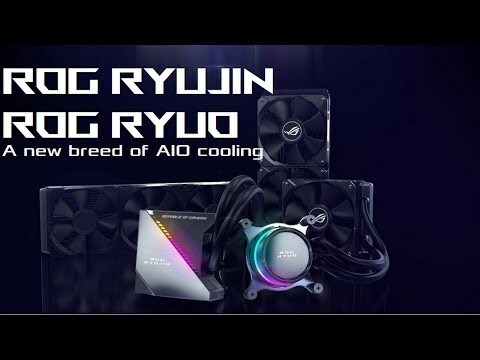 A NEW BREED OF AIO COOLING ROG Ryujin is the flagship all-in-one cooler for high-end builds designed to deliver the best thermal performance. Featuring Noctua IndustrialPPC fans for cooler and quieter operation, plus an embedded fan in the pump housing for additional cooling to the VRM and M.2, ROG Ryujin keeps your system running its absolute best. Coupled with a LiveDash OLED that displays system stats or custom graphics and Aura Sync RGB lighting, ROG Ryujin is the ultimate thermal solution destined to become a vital part of your gaming rig. next level of customisation ROG Ryujin is the world's first All in One cooler to feature an embedded 1.77-inch LiveDash color OLED Screen that displays useful system information on compatible asus motherboards. This includes vital information such as temperatures, voltages, fan speeds, or frequencies. You can also customize LiveDash to display a customized image or animation (JPG/GIF) up to the size of 160 x 128 pixels highlighting your clan insignia or gamertag. PERFECT SYNCHRONIZATION WITH OTHER COMPONENTS Infused with Aura RGB lighting in dramatic slash patterns on the shroud, Ryujin exudes a vibrant glow that highlights the CPU at the heart of your build. The impact of Aura RGB lighting can be further enhanced with ASUS Aura Sync, which allows harmonized lighting effects with other Aura-enabled system components and external accessories. Aura software give you complete control of lighting across all compatible devices, letting you dial in the vibe you want to display quickly and easily. Pump embedded fan ROG Ryujin meets the thermal challenges of the latest multi-core CPUs with industrial-grade Noctua iPPC-2000 PWM fans on the radiator that deliver high performance and low-noise operation. The 120-mm fans generate 122 CFM of airflow at 2,000 RPM yet are extremely efficient with a 29.7-dB(A) acoustic footprint that's much quieter than competing fans. ROG Ryujin includes a 60mm fan embedded in the pump housing that circulates air to the CPU VRMs, M.2 slot and surrounding components to dramatically reduce temperatures for improved performance and stability. Easy to use interface The LiveDash software utility lets you easily customize ROG Ryujin's LiveDash OLED display and RGB lighting effects. Select which system stats to monitor, choose personalized GIFs and images to display, and control RGB lighting from an intuitive interface that arranges settings in a step-by-step flow from top to bottom. ASUS ROG Ryujin, 240mm ALL-In-One Hydro CPU Cooler, w/ 1.77" Colour OLED Display & Aura Sync RGB Block, 2x 120mm PWM Fan is rated 1.5 out of 5 by 2. Rated 1 out of 5 by GreyFox from Beautiful to look at...Pump broke in the first few days... I pre-ordered the Ryujin 240 way back around early November time, it was due to be delivered on the 30th (I think) however, Scan had a delay ect ect which was cool because they contacted me a while before to let me know plus waiting a day or so for quality was cool with me. I didn't actually install the product until a few days ago.... I set it up and it looked AMAZING!!!! Then I find the "pump" has died.. I tried changing it in AI Suite 3 and the BIOS with no joy. I really REALLY wanted this product to work as it looks HOT plus with paying over £200 for a product that was new on the shelves made me want it even more. The temps I did record when it was working was good, not amazing but more than acceptable! I really don't want to make you think "I don't want to give that a try because of my review" but i would wait to see other peoples reviews first to get a lay of the land before investing! I have contacted Asus to see if they can do anything because if I return it I won't buy another and I kinda had my heart set on this. Please just check out other reviews to see if this is an common problem or just an isolated one before parting with your cash.